Sophomore Andy Young hits a pop fly in Sunday's game against Richmond. Young went 0-2 as the Spiders defeated the Colonials 6-2 to complete a three-game sweep. 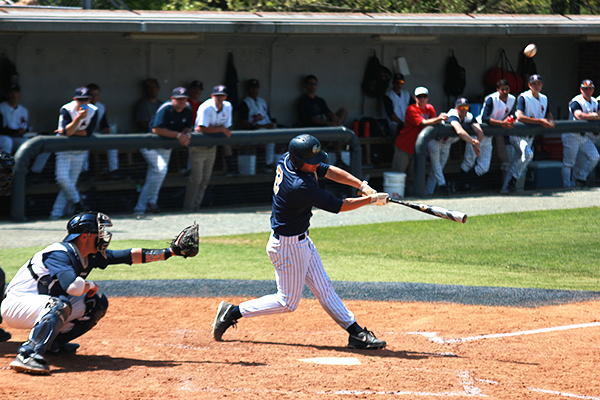 Sophomore Andy Young hits a pop fly in Sunday’s game against Richmond. Young went 0-2 as the Spiders defeated the Colonials 6-2 to complete a three-game sweep. RICHMOND, Va. – A series sweep by the Spiders spun the Colonials’ postseason hopes down to the last thread. GW had won back-to-back conference series and put itself in contention for a spot in next month’s Atlantic 10 tournament, but took a step back at Richmond this weekend as rookie mistakes plagued one of the nation’s youngest starting lineups. With three conference series left to play, including one series at home, the Colonials will sit in a near-must win situation every game to turn the rebuilding year into a tangible success. The team made an unexpected run to the postseason and finished in the top four in the conference last year. At 6-12 with nine conference games left on the schedule, the Colonials will likely need to finish conference play with a series victory at VCU next weekend and sweeps against A-10 basement teams Rhode Island and St. Bonaventure. After GW went up 2-0 in the second inning Friday night, the game was postponed because of thunderstorms, halting the Colonials’ momentum. The Spiders seized their opportunity to regroup and took the lead with a three-run homer when play resumed Saturday. GW would go on to lose the game 6-3. In the second game of the series, the Colonials fell to the Spiders 3-1, after GW bats were unable to support sophomore starter Bobby LeWarne. In a solid start, LeWarne gave up three runs, two earned, in seven innings. With a series loss already behind them, the Colonials had a shot to finish the series strong Sunday and were playing against the same pitcher they tagged for two runs Friday afternoon. But against the Spiders 6-foot-7 southpaw, GW only scraped across one run, typically waving at pitches out of the strike zone. As the offense sputtered, senior Aaron Weisberg – who threw 24 pitches in Friday’s postponed game – ran into trouble in three of his four innings on the mound. Weisberg’s afternoon was over after a ground ball went under the glove of usually sure-handed third baseman Bobby Campbell, scoring the the third run of the inning. The Colonials had several chances to put runs on the board against Richmond in the game. Down just one run in the top of the fourth, GW loaded the bases with an opportunity to do some damage at the plate with two outs in the inning, but freshman Cody Bryant struck out swinging to conclude the top of the inning. The Colonials had another opportunity in the top of the fifth with two runners in scoring position, but squandered the chance with a fly-out to left field by sophomore Andy Young and a groundout to third by freshman Campbell. GW’s only other run came on a solo shot by junior Ryan Xepoleas in the bottom of the ninth inning. Frustrated by their inability to produce at the plate, the Colonials slowly allowed that frustration to spill onto the field. After weakly flying out to right field on the first pitch to end the top half of the eighth inning, senior Owen Beightol tossed his bat by the plate in exasperation as he ran to first. Senior Colin Milon was inserted in the bottom of the eighth and would be GW’s fifth pitcher of the game. The first batter he faced popped it up in front of the GW dugout, but his teammates didn’t clear a path for him to catch the ball. Upset, he shouted “give me the ball” and returned to the mound. On Milon’s next pitch, freshman Andrew Selby lost a routine fly ball to right field in the sun. GW would eventually lose Sunday’s game 6-2, despite the bullpen holding the Spiders to just one run in 4.2 innings of relief.